Transfer music, photos, videos, playlists from your iPhone, iPad& iPod to iTunes Library& PC for backup, to manage music and photos freely. iTunes Library Corrupted? Not Enough Storage on Your iPhone? Fix It Here! Sync all your devices – iOS file transfer, transfer music (purchased/downloaded), photos, playlists, movies, TV shows, music videos, podcasts, iTunes U and audio books from one iDevice to your PC, iTunes or any other iDevice. All file information will remain intact even after the transfer, including the ratings. With this iOS file transfer app, you can easily transfer your device’s music library and share your playlists with iTunes, iOS Devices or any PC you select. Simply connect your device and share music with the complete information of the songs with just one click. As an extra bonus, the iOS file transfer app will also identify the duplicates and only copy unique files. Copy music to iTunes, iDevice or PC. Transfer and share all music elements from your iDevice, including album artwork, playlists, ID3 tags, ratings, play counts etc. Automatically convert iOS-unsupported formats to compatible ones. Fix & optimize songs’ incomplete ID3 information to iPhone directly. Lossless Audio Quality – Maintain 100% original audio quality after transferring. Share purchased music with different apple IDs. Intelligently recognize duplicate music files and thus transfer only unique ones. 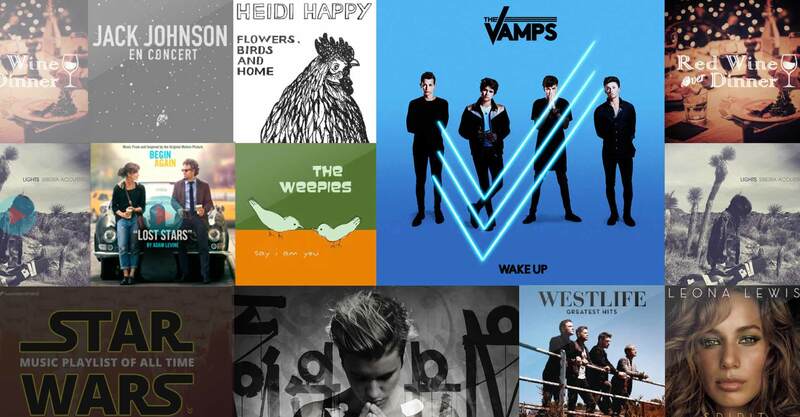 Transfer not only songs but entire playlists at one time. 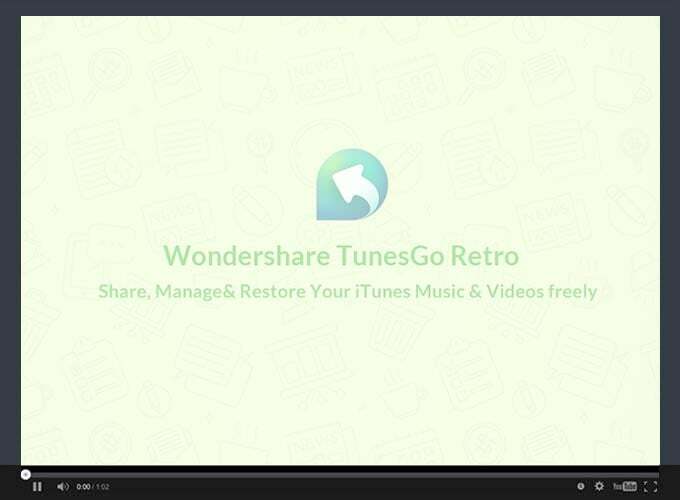 Transfer music & playlists without iTunes restriction. With this iOS file transfer app, you can transfer photos and videos present on your iOS devices to iTunes, other iOS Devices and your PC/Mac. You can also selectively delete single photo and also convert live photos to GIF format. Transfer photos from your iPhone to your PC for backup. Transfer photos and videos between your iPhone and iPad, and from iTunes to iPhone. Delete photos/videos with a single click. Export photos and videos from your PC to your iPhone or iPad. Rebuild lost iOS device - captured photos and albums from the device to your PC. Convert live photos to GIF format which makes social sharing simple. Selectively delete photos instead of iTunes’ deleting photos by file. Read iPhone’s albums by “types” to keep photos well-organized. Support many photo sources, such as photo stream, SD card etc. Back up/Transfer iTunes U/Podcast/Audiobooks from iPhone to PC, from iPad to iPhone, between iPhone and iTunes and between iOS device. Export text messages, MMS & iMessages with attachments from iPhone to PC/Mac. 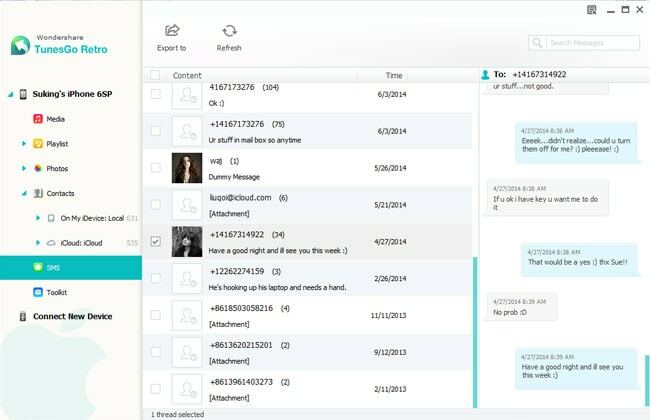 Back up SMS/MMS/iMessages on your PC in HTML/XML/TXT files for easy viewing. Import & Export contacts from major address books, such as Outlook, Exchanges, vCard etc. Support two-way transfer; you can transfer contacts between iPhone and Mail boxes. Smartly merge duplicate contacts with this iOS manager. Directly add or edit contacts. Want to share stuff to all your iDevices or with your friends? Bored of repeatedly syncing your devices with iTunes? With this iOS file transfer app, you can do this easily with just one click. Connect multiple Apple devices to your PC at the same time. You can connect your iPhone and iPad to PC simultaneously, and also transfer music from your iPhone to iPad with this iOS file transfer app. Without iTunes installed on your PC, you can transfer music, photos or any other files directly to your iPhone, iPod and iPad with a single click. The iOS file transfer app is compatible with all iOS devices, including iPhone 6S, iPhone 6, iPad Air, iPad mini, iPod touch, iPod nano, iPod shuffle, iPod classic and others. TunesGo Retro is a user-friendly iOS transfer tool and manager that offers excellent service and experience for users. Below are some of the star features, which deserve your close attention. Automatically fix and populate album art, song information, album information and more. This powerful audio forensics database is similar to the one utilized by iTunes and can even detect unique remixes. Intelligently export exclusive files to iTunes, so you only copy what’re missing in your music library and automatically filter the duplicate files. Smartly merge all duplicate contacts when you combine the contacts from different sources by clicking the De-duplicate button. Back up your songs, along with all other related music elements to iTunes, including ratings, play counts, ID3 tags and skips, which helps create iTunes new smart playlists. Moreover all the files can be transferred at the same time with a single click. iTunes Library Lost or Damaged? If you have a new PC or have suffered a system crash, then the iOS transfer file app can rebuild your entire iTunes library from your iPod, iPhone and iPad. 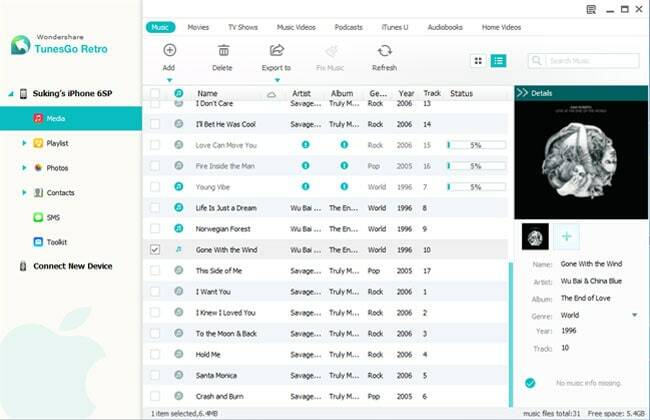 Simply connect the devices and export your music and videos with all the song information (ID3 Tags), as well as playlists, play counts, ratings, skips and more. Copy to iTunes: Automatically detect the difference files between iTunes and iPhone and only transfer what's missing. Fix Music: Automatically fix and populate album art, song information, album information and more. 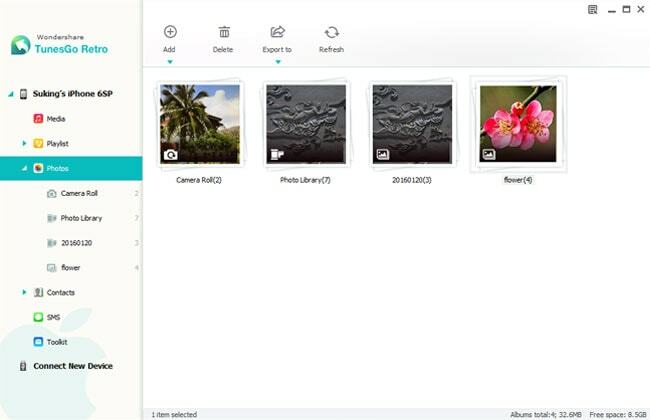 Transfer Photos: Transfer and manage photos with different types and topics, such as Camera Roll, Photo Library etc. 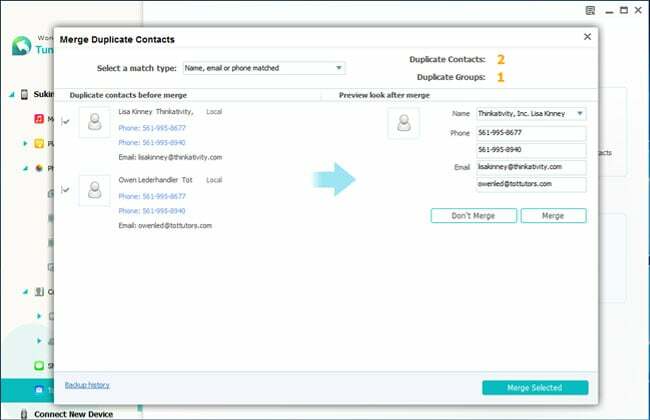 Merge Duplicate Contacts: Manage contacts, automatically detect the duplicate contacts and then merge them. Transfer SMS: Transfer SMS, iMessages from iPhone to computer and release more space for your iPhone. Discover, Download, Manage and Enjoy your favorite music with TunesGo. 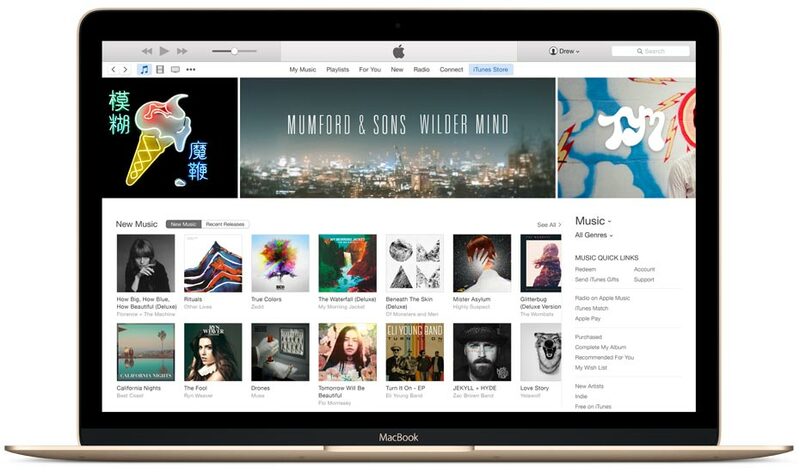 Move your music from any device to another – iTunes to Android, iPod to iTunes, PC to Mac. Take full control of your phone from your computer, enjoy your social life on the big screen, play mobile games with your mouse and keyboards. Transfer photos from iPhone to iPhone, iPad to iPad, iPhone to iPad and iPad to iPhone: The iOS transfer includes transferring audio files, videos, photos, playlists and contacts. Transfer audio files and playlists from iPod to iPhone, iPhone to iPod, iPad to iPod, iPod to iPod and iPod to iPad. Transfer music from iPhone to iTunes and iPad to iTunes: The iOS transfer includes transferring audio files, playlists and videos. Transfer audio files and playlists from iPod to iTunes. Transfer music from iTunes to iPhone and iTunes to iPad: The iOS transfer includes transferring audio files, videos and playlists. Transfer Audio files and playlists from iTunes to iPod. Transfer photos from iPhone to PC and iPad to PC: The iOS transfer includes transferring audio files, videos, photos, playlists, contact and SMS. Transfer audio files and playlists from iPod to PC. Transfer music from PC to iPhone, PC to iPad and PC to iPod touch: The iOS transfer includes transferring audio files, videos, photos, playlists and contacts. Transfer audio files and playlists from PC to iPod. Audio files: Include music, Podcasts, iTunes U and Audiobooks. Videos: Include movies, TV shows, music videos, home videos, Podcasts and iTunes U. 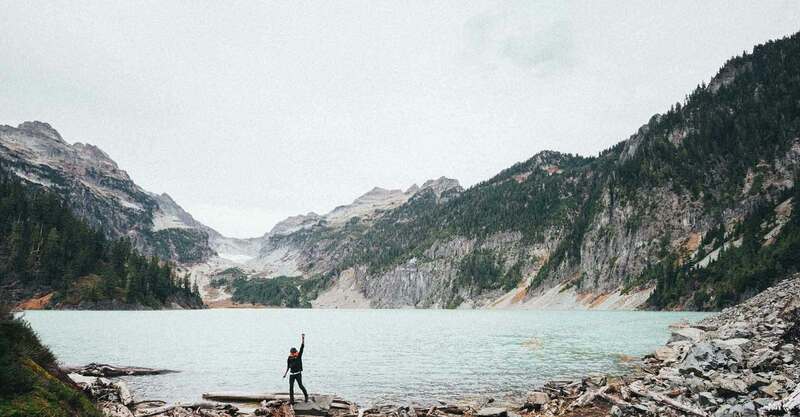 Photos: Include common photos, photo stream and converted GIF photos from live photos. Contacts: Include vCard and contacts from Outlook Express/Windows Address Book/Windows Live Mail. SMS: Includes text messages, MMS and iMessages with attachments. Automatically convert iOS-unsupported formats to iOS-compatible formats via the transfer. Convert live photos from iPhone 6/6S to GIF format, which compresses the photos and makes social sharing more convenient. GIF Maker: Convert any photos or video from Apple Devices or PC to GIF images, which makes it far more interesting to share the content. Fix music tags/covers: Automatically fix and optimize your songs’ incomplete ID3 tags and covers in your iPhone/iPad/iPod directly with a single click. This powerful audio forensics database is similar to the one utilized by iTunes' own platform and it can even detect unique remixes. Edit contacts: Edit the imported existing contacts, including revised contact name, mobile phone and email address, as well as group. Add new contacts: Add new contacts to your current contact list. Delete audio files: Delete audio files selectively by connecting your iOS devices. Delete videos: Delete videos easily by connecting your iOS devices, which opens up more space for your iDevices. Delete photos: Delete photos selectively by connecting your iOS devices. Delete contacts: Delete single contacts or in batches. Smartly merge all duplicate contacts when you combine contacts from different sources by clicking the De-duplicate button. If you have a new PC or have suffered a system crash, then this iOS file transfer app can rebuild your entire iTunes library from your iPod, iPhone and iPad. 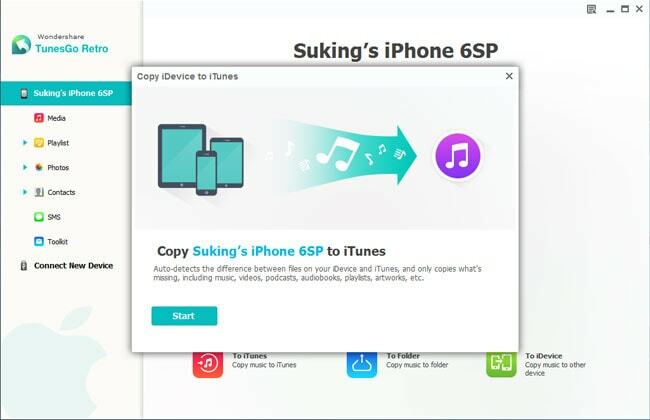 You simply need to connect the devices to export your music and videos, along with all the song information (ID3 Tags), playlists, play counts, ratings, skips and other details.